Custom reproduction home designed by Al Beoll, the architect for Peddlers Village, from re-purposed barn beams, doors and lumber. Custom built cabinetry from re-purposed hardware store cabinetry, doors, shutters and displays. Enter through the Grand front door with antique RR Hardware Circa 1870 into the vestibule with tiled floor, powder room and coat closet. Continue through the double glass doors into the first floor Great Room with soaring 18 feet ceiling, a Rumford Fireplace, Balcony, and Dining Room. To the left is the Main Floor Master Suite with a Walk-in closet/Dressing Room and Custom Bath with an over-sized shower, bidet~ and soaking tub. Opposite on the right is the comfy Den with Library Shelving and the whole house Bose Sound System Control Center. Next you will find the divine Canaan Kitchen with pantry doors made from 19th Century Interior Shutters and floor tile from Mexico. Traverse the beautiful stairway with custom risers to the Balcony overlooking the Great Room. On your right is a full en-suite Bedroom and Custom Bath with over-sized shower, bidet and soaking tub. Across the Balcony is another en-suite Bedroom with a Walk-in Closet, Custom Bath with over-sized shower, bidet and Soaking Tub. Outside of the Great Room / Dining Room is an expansive deck which can also be accessed through the sliding glass wall. The home is completely heated by Radiant Heat, has Central Air and a Generac Generator for back-up electricity. The Flooring in all the Private areas is Antique Refinished Pine; the "Public" Areas have Antique Refinished Chestnut. This home is a great example of Period Post and Beam Construction. Most Notably the "Summer Beam" between the Great Room and Dining Room. Other features are a pull down attic, hurricane trussing, and foam insulation throughout. The large Steel I-Beamed Walkout Basement has insulated poured concrete walls and 9 Foot Ceilings. The driveway is graced with a custom Wrought Iron Gate, driveway alarm and a 3 car Parking Shed with an attached Pottery Barn. 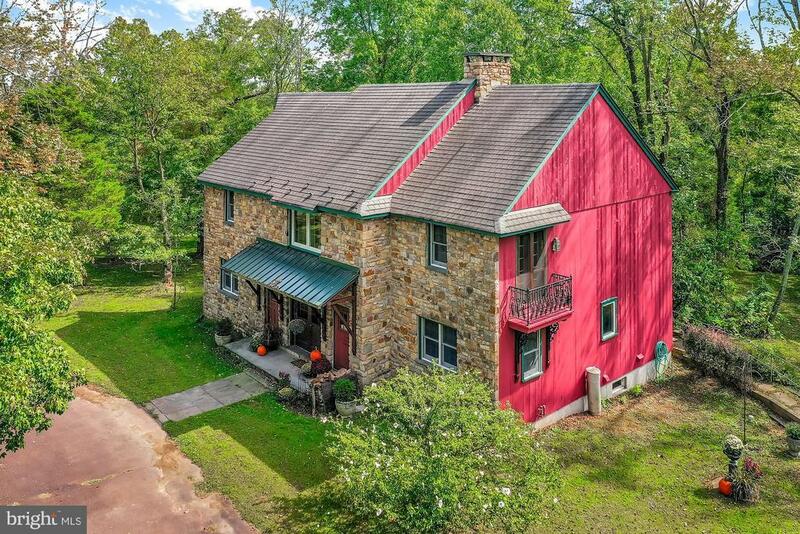 This property sits across from a 70 Acre preserved lot. This home is preferred to be sold with the lot at MLS #7276075. Directions: From Old Windy Bush Rd turn onto Aquetong towards River Rd; From River Rd North turn left onto Aquetong Rd.